In Hyperopia objects far away are clear but there may be difficulty in focusing objects at near depending on age and the amount of hyperopia. Hyperopia is correctable with spectacles and/or contact lenses. 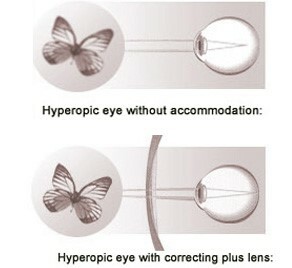 Hypermetropia will be corrected by concave lenses. Usually over and above +3.00D the lenses will be thick and Hi Index and aspheric lenses are recommended. Contact lenses are another option whereby you can get the freedom from your heavy and thick spectacles. Our Eye Care Centre optometrist will be very happy to assist you. Eye Care Centre is very well equipped with modern lens processing lab and advanced lens fitting machines with well experienced technicians. Eye Care Centre also deals with international brands like Essillor, Hoya, Zeiss brands and polycarbonate, CR39, Trivex and traditional mineral products with superior anti reflective coating. To have full experience of Eye Care Centre, Pls book your slot for free eye examination online at nearest Eye Care Centre and our optometrists will be very happy to test and help you and suggest suitable lenses for your needs and lifestyle. Thanks a lot for valuable points. The argument is fantastic. Keep it up.